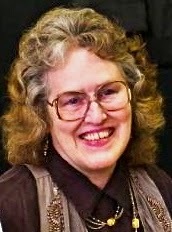 Maryann Miller is a literate Texan who covers the book/literary universe on her blog, "It's Not All Gravy." Her website lists her as an award-winning "diverse writer of columns, feature stories, short fiction, novels, screenplays and stage plays." Among her numerous honors was being a semi-finalist at the Sundance Institute for her screenplay, "A Question of Honor." "I've been writing all my life," she says, "and plan to die at my computer, hopefully after finishing a book, not in the middle of one." 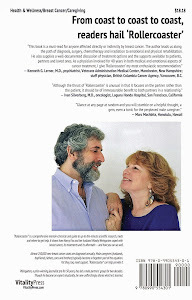 Still very much alive, she posted a review today (Jan. 25, 2015) that recommends my VintagePress book, "Rollercoaster: How a man can survive his partner's breast cancer." 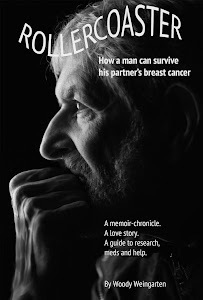 Any person who has had cancer, or cared for someone with cancer, which means a whole lot of us, will find this book engaging and well worth the read. It is not meant as a caregiver’s guide, although one can take wisdom from some of the ways Woody and his wife coped with her cancer diagnosis and subsequent treatment. The book is an honest chronicle of the experience from day one, to a wonderful conclusion that is sure to make readers smile. With that honesty comes great doses of humor and the harsh reality that dealing with cancer is an all-consuming experience. Although the book focuses in large part on the author’s reactions to the cancer roller-coaster, there are sections from the point of view of his wife, Nancy, and the reader is privy to some of her emotions, which also seem to careen wildly at times. The chapter on medications alone is well worth the price of the book. It details the pros and cons of many medications, such as Avastin, which had been touted as a life-saving drug but lost its FDA approval in 2011. • These feelings are normal. • Even after successful treatment, fear is still always there. • While humor can definitely ease stress, anxiety can be malignant. • Focus on staying healthy. • False information is rampant. • Don’t wait. You can never be sure there will be a tomorrow. Wow, thanks for the kind words about my writing. This was all supposed to be about you and your book. LOL I'm honored. Wow! Thanks for sharing my review and the links to my blog and website. I'm honored that you think so highly of what I am doing over at It's Not All Gravy. I definitely believe in mutal-admiration societies.